Weeding through all the parent books out there can be overwhelming to say the least. 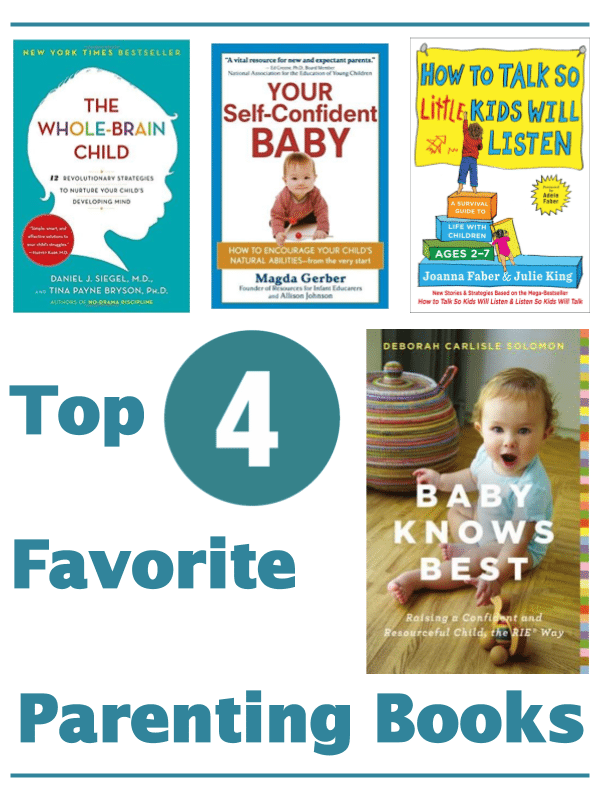 We have read and reviewed a lot so we want to give your our top four! Hands down best gift for expecting parents. “Baby Knows Best” is a simple, modern, and thoughtful introduction to the Resources for Infant Educarers (RIE) philosophy. Best for brain research, clear and well organized with practical examples, cartoons, and words for parents. “The Whole Brain Child” is also perfect for those who suddenly are finding themselves needing more tools for their toddler, preschooler, or big kid. Written by the children of the authors of the 80s “How to Talk so Kids Will Listen” this is a modern version with more stories, more examples, and new brain research. The tools in this book will set parents on the right track for supporting their 2 year olds well into their teens. One more baby book that we couldn’t leave off the favorites list is absolutely perfect for parents who are on the nervous side. Written by Magda Gerber the founder of RIE it is straight from the source, inspiring, and challenges societal thinking about infants and toddlers.